Silverfish | Pest Control Omaha - Exterminator | Omaha Pest Control, Inc.
Omaha Pest Control has many years of experience controlling these pests. Siverfish are a very common pest in Omaha, Nebraska and its neighboring cities. 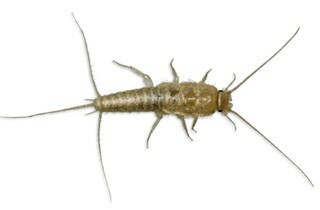 Silverfish get their common name from the three bristle like appendages on the rear of their body. Their teardrop shaped body is covered with silver scales and measures ½ to ¾ inch in length. They prefer to feed on paper or wallpaper with their chewing mouthparts and they may live up to a year without food, but require humidity to survive. Silverfish are medically harmless, but are a nuisance pest inside structures and may contaminate food, damage paper goods and stain clothing. Omaha Pest Control has standard pricing for all our pest control services, based on the size of the home and materials used. Free Estimates are provided. Call OPC at (402) 250-0425.